Selecting the best food for Husky puppy dogs isn’t quite as straightforward as many new dog owners expect! In fact, as a new Husky puppy owner, you’re facing a rather steep learning curve—pretty much from day one! You’ll need to choose a suitable Husky puppy food, plan out your new puppy’s daily meal schedule, and monitor how much your puppy eats at each meal. This way you can adjust portions and meal times as your puppy grows. You also may have to troubleshoot any digestive issues that arise. It’s a lot to learn about all at once! To help you out, this article provides all the information you need to pick the best dog food for your Husky puppy. We’ve also put together a Husky puppy feeding guide so you can calculate the right amount of food. What to Feed a Husky Puppy – Does Breed Matter? Here, there can major differences in a dog’s size. A standard-size Husky generally weighs between 35 and 60 lbs in adulthood. Whereas, a miniature Husky dog weighs between 15 and 35 lbs fully grown. Both standard and miniature Huskies have active, playful temperaments. This is typical of working dog breeds. They were bred to stay lean and trim. Standard Huskies, in particular, were historically bred to do a surprising amount of work on a relatively small amount of food. Researchers are still learning exactly how Huskies alter their metabolism and respiratory capacity. This allows them to race incredibly long distances without tiring or stopping for food and water. Working sled dog breeds are typically fed a diet high in protein and fat. This is ideal for a dog that runs for long hours between feedings. But no matter which Husky you’re caring for, you want to feel confident you’re feeding them the right type of food. And the right amount of Husky puppy food! What Should I Feed My Husky Puppy? The genetic makeup of your Husky puppy’s (Siberian, Alaskan, American, mini) can influence the food they should eat. Siberian Husky puppies tend to have more sensitive digestive systems than other Husky breeds. This could down to their unusual metabolic abilities and long history as sled dogs. Some Husky owners prefer to feed their dog a raw food diet. But this is not really advised during puppyhood while your pup’s immune system is still developing. It’s best to speak to your dog’s veterinarian before switching your puppy to a raw food diet. Always consult your puppy’s veterinarian if your dog starts to show signs of stomach sensitivity. This can include vomiting or diarrhea. Your dog’s vet may want to start your puppy on a limited ingredient diet (LID). Or switch them to a food formulated for sensitive stomachs. The best food for Husky puppy dogs is one that is formulated for puppies (not adult dogs or senior dogs or “all life stages” food). It’s always important to feed your pup age-appropriate food (up to six months, up to one year, etc.). Veterinarians often recommend feeding your dog a combination of 80 percent dry kibble and 20 percent canned wet or loaf food. This offers nutritional variety while supplementing water intake. And it also helps your Husky puppy gets used to different food tastes and textures. Also, make sure your puppy has access to plenty of fresh water at all times. There is no one single right answer to the question of how much food should I feed my Husky puppy. It will depend on what kind of food you’re feeding your Husky puppy—raw food, kibble, wet food, home-cooked food, or a combination. The choice of food influences how much your Husky puppy eats. Some foods have a higher nutritional content so you can feed your dog less. Always remember, when you’re trying to figure out how much to feed your Husky puppy, breed and projected adult size should be the most important determinants of portion size. For instance, American Huskies typically weigh up to 15 lbs more than Siberian Huskies in adulthood. This means you should probably feed your American Husky a large breed puppy formula. And in addition, choose appropriate portions. In contrast, mini Huskies grow to around half the adult standard Huskies. So, they may only need a small breed puppy formula and portions appropriate for a small dog. In general, Husky dog breeds—Siberian Huskies in particular—have a historically low tolerance for processed dog food ingredients such as corn, soy, gluten, wheat, and dairy. Therefore, you should try to avoid additives, preservatives, fillers, and by-products where possible. Good food for Husky puppy dogs provides the right balance of protein, fat, and carbohydrates. These should be sourced from whole-food ingredients. You can feed your pup high-quality puppy food in lower quantities with less risk of digestive upset or obesity. Many breeders suggest feeding your Husky puppy as much food as they can consume within five to 10 minutes. Then, immediately take away the uneaten food away. Repeat this 2–3 times per day or as the breeder, veterinarian, or food manufacturer recommends. When you first bring your new Husky puppy home, it’s often recommended to continue feeding the same puppy food—for at least the first two to three weeks until your puppy settles in. Then, if you want to change your puppy’s food, transition your pup from the old to the new food over a one-week period. Follow the feeding schedule recommended by the breeder, veterinarian, or rescue shelter. In most cases, this will be evenly spaced feedings 2–4 times a day. Around three months of age (12 weeks), you can start feeding your Husky three times per day. Then, with the vet’s approval, twice a day (morning and evening) should be enough from six months of age. At one year, talk to the vet about moving your Husky puppy onto an adult maintenance dog food. The best dry food for Husky puppy dogs will factor in the unique nutritional needs of growing, active puppies. Choose a puppy formula recipe ensures the food is whole and complete for this short but critical period in your dog’s life. Blue Buffalo Wilderness High Protein Grain Free Natural Puppy Dry Dog Food is a high protein puppy food that contains pure meat protein (chicken). It also has LifeSource nutrient bits (vitamins, minerals, and antioxidants), as well as fruits, vegetables, and omega-3 fatty acid (DHA) to round out this puppy food. This brand is also free from common digestive irritants such as wheat, corn, soy, by-products, fillers, artificial flavors, and preservatives. Another natural dry puppy food is the Natural Balance Whole Body Health Dry Puppy Formula containing chicken, brown rice, and duck. The added vitamins, minerals, antioxidants, fruits and vegetables, and DHA/EPA plus omega-3 and omega-6 fatty acids will help your pup to develop and keep them healthy. You could also try the Taste of The Wild Grain-Free Premium High Protein Dry Dog Food High Prairie Puppy with Roasted Venison and Bison. The grain-free recipe features premium real protein ingredients in a smaller kibble that is easier for puppies to pick up and chew. The recipe has a full complement of vitamins, minerals, antioxidants, DHA/EPA, and probiotics to aid digestion. This food also boasts no grain, wheat, corn, fillers, soy, artificial colors/flavors/preservatives. Feeding wet dog food for Husky puppy dogs not only keeps mealtimes fun and interesting, but it can get your puppy used to new food tastes and textures early in life. Wet food can also make for great Husky puppy treats. Blue Buffalo Wilderness High Protein Grain Free, Natural Puppy Wet Dog Food is a natural wet puppy food that comes in a 12-pack of 12.5-ounce cans. Real meat protein is the main ingredient, enriched with vitamins, minerals, DHA, and antioxidants. It’s also free from common digestive irritants like wheat, corn, soy, by-products, fillers, and artificial ingredients. Sojos Complete Natural Freeze-Dried Natural Raw & Dehydrated Grain-Free Dog Food is a simple, nourishing dehydrated food recipe. It’s made with water for a warm, wholesome meal and contains freeze-dried raw protein (poultry and fish). Plus, freeze-dried fruits and vegetables with added vitamins, minerals, and antioxidants. One package makes 12 pounds of wet puppy food. If you’re looking for a LID wet puppy food, CANIDAE Grain-Free Pure Dog Wet Food in the Puppy Chicken Formula Limited Ingredient Diet is a perfect choice. It’s great for pups that need a soothing and highly palatable protein-rich food source. The recipe consists of real chicken protein with chicken broth plus vitamins, minerals, antioxidants, and essential fatty acids. Puppyhood is a biologically chaotic time in any dog’s life. Their body is developing at lightning speed, including their immune function and gastrointestinal system. If your pup seems to be developing stomach issues, the best food for Husky puppy dogs may be one that eliminates common food-based irritants. Nature’s Recipe Grain Free Dry Dog Food Puppy Chicken, Sweet Potato & Pumpkin Recipe is a simple chicken, sweet potato, and pumpkin recipes. This food is designed to be easy to digest even if your puppy has a sensitive stomach. The first ingredient is real meat protein and there is no corn, wheat, artificial ingredients, or fillers that could irritate your pup’s stomach. Another great option is the Wellness Complete Health Natural Grain Free Dry Dog Food Puppy Chicken & Salmon. The gentle chicken and salmon recipe is free from known irritants including wheat, soy, corn, by-products, fillers, and artificial ingredients. It contains probiotics, antioxidants, easy-to-digest fruits and vegetables, vitamins, minerals plus flaxseed to support healthy digestion. If your puppy is suffering from digestive disruption, a freeze-dried raw diet that is grain-free may help restore balance. The Instinct Raw Boost Puppy Grain Free Recipe Natural Dry Dog Food by Nature’s Variety is an excellent option. This food features a high-protein dry kibble plus freeze-dried raw protein bits with digestion-easing probiotics, omega fatty acids, vitamins, and minerals. The food contains no corn, soy, potato, wheat, by-products, or artificial ingredients. 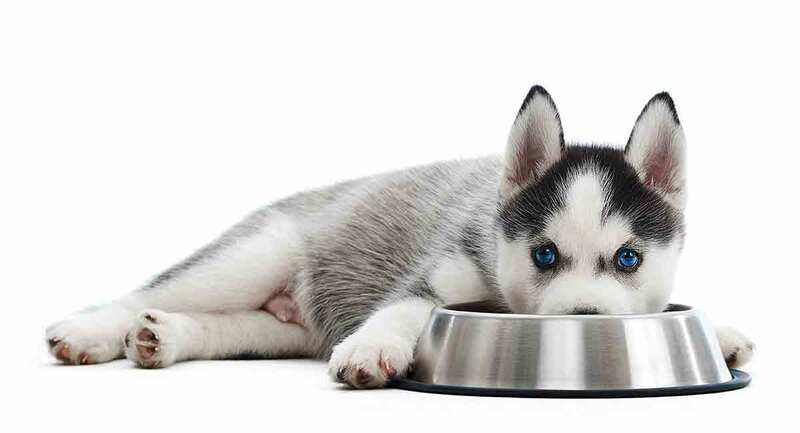 Searching for the best food for Husky puppy dogs who are struggling with digestive disturbances can often mean seeking out a limited ingredient diet. By limiting the ingredients your puppy eats, it becomes easier to rule out specific foods as a potential cause for allergies or health concerns. Natural Balance Limited Ingredient Dry Dog Food (Potato & Duck Formula) is a limited ingredient puppy food featuring a single protein source (duck). It’s also packed with potato and plenty of vitamins, minerals, and antioxidants—everything a growing puppy needs. This food is free from all artificial ingredients and fillers. In addition, the kibble is a smaller size that is easier for puppies to grasp and chew. CANIDAE Grain Free PURE Dry Dog Food (Chicken, Lentil and Whole Egg Recipe) is a soothing and wholesome puppy food. It features perfect protein and easy carbohydrates to support healthy digestion. The recipe is formulated for both sensitive stomach issues and for puppies that are on a LID (the recipe only has nine ingredients plus vitamins and minerals). Or you could try Blue Buffalo Basics Limited Ingredient Diet, Natural Puppy Dry Dog Food in Turkey & Potato. This limited ingredient diet puppy food features real whole meat turkey protein in a base of potato with pumpkin to help ease digestive distress and discourage allergies. The food also contains LifeSource bits of vitamins and minerals. The recipe has no chicken, beef, dairy, eggs, wheat, fillers, corn, soy or artificial ingredients. We hope you’ve enjoyed learning about Husky puppy dog food brands and feeding guidelines. Still having trouble deciding between one Husky puppy food brand and another? If you need extra guidance for feeding Husky puppy dogs, we encourage you to reach out to your puppy’s veterinarian or breeder.